CSIR- NIIST Notification is out. 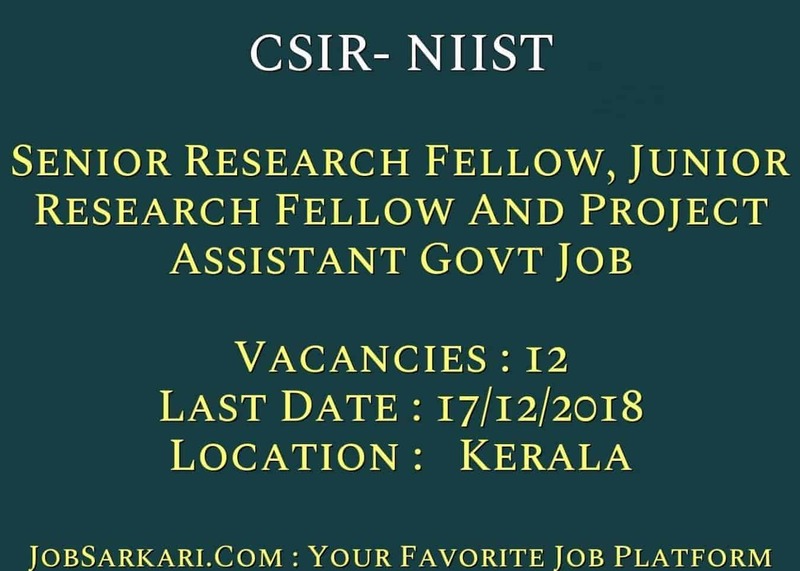 CSIR- NIIST is recruiting for 12 Senior Research Fellow, Junior Research Fellow And Project Assistant Govt Job Posts. You can check CSIR- NIIST - Council of Scientific & Industrial Research last date, download CSIR- NIIST notification, visit CSIR- NIIST official website and check other CSIR- NIIST Vacancy details.Complete Vacancy and recruitment Details about 12 Senior Research Fellow, Junior Research Fellow And Project Assistant Govt Job vacancies in CSIR- NIIST are provided below by JobSarkari.Com only for you. Walk in Interview. 07/12/2018 to 17/12/2018. Sr. Research Fellow (Project). Candidate Must Have Passed M.Sc Chemistry With 55% Marks And Must be NET/ GATE Qualified With 2 Years Research Experience in Related Field. Candidate Must Have Passed M. Pharma, Pharmaceutical chemistry With 55% Marks And 2 Years Experience in Related Field. Max 35 Years. 07/12/2018. 01. Junior Research Fellow. Candidate Must Have Passed M.Sc Life Science With 55% Marks And Must be NET/ GATE Qualified. Candidate Must Have Passed M.Pharma. Pharmaceutical Chemistry/ BAMS/ BSMS With 55% Marks. Max 30 Years. 07/12/2018. 01. Project Assistant-II. Candidate Must Have Passed B.Tech in Mechanical Engineering With 55% Marks. Max 30 Years. 10/12/2018. 01. Project Assistant-I. Candidate Must Have Passed Diploma in Mechanical Engineering/ Polymer Technology With 55% Marks. Max 28 Years. 10/12/2018. 01. Jr. Research Fellow (Project). Candidate Must Have Passed M.Sc in Biotechnology/ Biochemistry With 55% Marks And Must be NET/ GATE Qualified. Max 30 Years. 11/12/2018. 01. Jr. Research Fellow (Project). Candidate Must Have Passed M.Sc in Biochemistry/ Biotechnology/ Zoology With 55% Marks And Must be NET/ GATE Qualified. Max 30 Years. 11/12/2018. 01. Project Assistant II. Candidate Must Have Passed M.Sc Biotechnology With 55% Marks. Max 30 Years. 12/12/2018. 01. Project Assistant II. Candidate Must Have Passed M.Sc Biopolymer Science With 55% Marks. Max 30 Years. 13/12/2018. 01. Project Assistant II. Candidate Must Have Passed M.Sc Applied Chemistry With 55% Marks. Max 30 Years. 13/12/2018. 01. Jr. Research Fellow (Project). Candidate Must Have Passed B.Tech in Chemical/ Mechanical/ Environmental Engineering With 55% Marks And Must be NET/ GATE Qualified. Max 30 Years. 14/12/2018. 01. Project Assistant II. Candidate Must Have Passed M.Sc in Microbiology/ Biotechnology With 55% Marks Max 30 Years. 17/12/2018. 01. 4. Candidate Need to Go on Given Address on 07th December 2018 to 17th December 2018. CSIR-National Institute For Interdisciplinary Science And Technology, Industrial Estate PO, Pappanamcode, Thiruvananthapuram-695019. Q. What is the Last Date For CSIR- NIIST Senior Research Fellow, Junior Research Fellow And Project Assistant Govt Job Vacancy ? A. 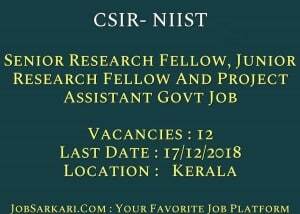 Last Date for CSIR- NIIST Senior Research Fellow, Junior Research Fellow And Project Assistant Govt Job Posts is 17/12/2018. Q. What is the Form Type of CSIR- NIIST Senior Research Fellow, Junior Research Fellow And Project Assistant Govt Job Recruitment ? A. The Form Type for CSIR- NIIST Senior Research Fellow, Junior Research Fellow And Project Assistant Govt Job Posts is Offline. Q. How many vacancies are available in Council of Scientific & Industrial Research Senior Research Fellow, Junior Research Fellow And Project Assistant Govt Job Posts ? A. There are about 12 Vacancies in Council of Scientific & Industrial Research Senior Research Fellow, Junior Research Fellow And Project Assistant Govt Job Posts. Q. What is the Full Form of CSIR- NIIST ? A. Full Form of CSIR- NIIST is Council of Scientific & Industrial Research .